Ootheca: Containing between 30-40 eggs with a 2-4 week incubation before hatching. Nymphs: 5-7 moults taking between 2-6months to reach maturity. Adults: Live on average for 6 months. Can be distinguished from nymphal stages by the presence of wings. 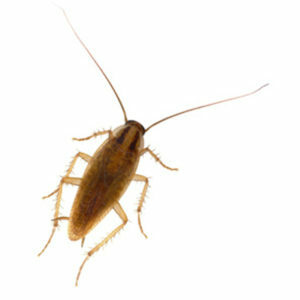 A small cockroach, 10-15mm long when adult. A pale brown with distinct dark parallel bands running the length of the pronotum. Nymphs and adults as capable of climbing vertical surfaces with ease. Females can be distinguished from males when adult by the broader more robust abdomen, with wings covering all segments of the abdomen. Females will carry the ootheca until the nymphs hatch. Primarily nocturnal pest, B.germanica prefers a moist, warm environment with an optimum temperature around 30°C. Consequently it has become a common pest of kitchens, larders and restaurants. The British climate does not normally allow for this species to survive outdoors. Faecal smears in conjunction with a distinctive odour are both clear indicators of an infestation. Closer examination of likely harbourages should reveal large numbers of B.germanica grouped together. 1. The British Pest Management Manual. Section 5, pg 63.